If there’s one thing I’ve learnt during my PhD it’s that truth is very often stranger than fiction. 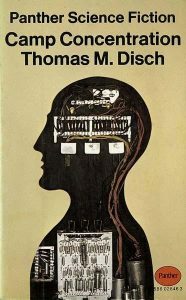 I’ve just recently finished reading Thomas M. Disch’s Camp Concentration (1968), in which prisoners in the United States are injected with a form of syphilis in order to boost their intelligence. Strange as this may sound, it’s nothing compared with real life. In 1972, whistle-blower Peter Buxtun revealed the that the US Public Health Service had been conducting secret studies on African-Americans, in the now infamous Tuskegee syphilis experiment. The study started in 1932 and ran for over 40 years without the participants knowing they had the disease, and without them ever being treated with penicillin.